and some make it a career." Criticism is simply a choice, to begin with. I don't like this. Then it can often turn into a fault finding mission. Of course, when you're looking for faults, they appear. The more you look, the more you find. It's the Law of Attraction at work. As we find these faults, we categorize and label them so that we can keep score and keep track. This is bad, this is really bad, this is disgusting, this is unfathomable, this is horrific, this is . . . and it goes on. This can become such a habit that we don't even realize it is happening, or how we sound when we write it out or speak our criticisms out loud. Just listen to people talking, open facebook, twitter, YouTube, go to work, in your kitchen. It sort of becomes natural to do this, but it is anything but natural. Some of this criticism or finding of fault, blaming, labeling, is relatively benign, and sometimes it becomes a career, a mission, a self-righteous purpose, a crusade. It is the length of time doing it and the depth of the feeling that makes the difference. Yet, let me bring this back to the basics again. It is simply an observation and a choice. You see something you do not like and that is perfect. This world could not work without the contrast with which to make choices. However, rather than focusing on the things you don't like about that, you may choose the real reason the contrast is there: to help you make a decision to choose what you do like and focus your attention there. We all know it's true that the more you focus on the fault, the more you will find. We often do not pay attention to the fact that the opposite is true as well: the more you focus on what you want, what is good, what is desirable, what is pleasing to you, the more you will find. The real question then is this simple: do you want to feel bad, or do you want to feel good. We know that when we focus on the faults, we can become enraged, angry, upset, disappointed, discouraged, frustrated, and more, and none of those feel good. So why do we persist in doing it? Habit. We see others around us doing it, we see it in the newspaper, on the radio, on TV, on YouTube, and Facebook and, well, it is hard to avoid. At the same time, when we turn and focus on what is pleasing to us, what we want, what we like, we feel good. We may feel love, appreciation, joy, enthusiasm, optimism, passion, and all of those feel very good. When we decide that it is important that we feel good, we can then allow all our emotions to guide us to better choices of focus, and enjoy our lives far more while the rest of the world may choose as it will. We Have The Ultimate Power: It Is Purely Our Own Choosing That Directs Our Lives. Spread Some Joy Today--How are you feeling? Joy feels good. because Alpo is up to 99 cents a can. Not really. . . but the reason I went with this funny quote is that I never, ever see my dog worry about the economy. He doesn't worry about getting fed. He doesn't worry about getting love. He doesn't worry about calories or getting fat, or losing weight. He doesn't worry about the news. In fact, he doesn't read the paper or watch the news, or use the Internet. He just doesn't worry at all. He is eager. He's eager to play. He's eager to go for a walk. He's eager to go for a ride. He's excited and eager to get his food when he decides he's hungry. He doesn't stress over things or circumstance. If I'm taking too long to get ready for a walk, he simply lays on the floor and looks at me curiously, or if he tires of that, he takes a quick nap. After he eats, he takes a nap. When he's bored, he takes a nap. His solution for any kind of potential stress is taking a nap. Works for me too when I do it. He's content to walk down the same path every day, yet eager to see a new one. He seems to find lingering scents to spend many moments regardless of the terrain, although he is infinitely more interested in other dogs have been down this path in the recent past. Dogs bark at him from behind fences and he doesn't seem to give a rip about that. Some sound big and mean and certainly loud, and he goes on as if it was nothing at all. He shivers when it's 67 degrees, but it can be 40 degrees and if he is on a walk, he's not paying any attention to shivers (Charlie is a little toy Chihuahua). He never gets tired or bored with love touching, caressing, petting, pampering. I think he could fall asleep with soft caresses and wake up wanting more. Hmmm. Sounds good to me. . . He gives me love by just looking at me working from across the room. He's always encouraging me to exercise, with him of course, and he dotes on my presence. Maybe some of these things would be good for we humans to emulate and incorporate. No stress? Seems like a wonderful idea! No worries? Seems unheard of yet potentially life-changing. Always eager? There's nothing like fresh enthusiasm! Patient? I don't know any humans who couldn't benefit from more of that! Always open to being loved? Why the heck not? Always present and always exuding love? Eckhart Tolle would be proud (well, no, he wouldn't ever be proud, would he?). It's Amazing What We Can Learn When We Pay Attention. Even From Our Friendly Animals. Spread Some Joy Today--It's the second largest shopping day of the year. I hope you find some joy there too. "Our world has many superheros. I was compelled to share this TED video with you today. It spoke to me in a number of ways. It is about seeing a larger picture and at the same time seeing much detail. It is about expanding ourselves in an unexpected and yet very grand way. It is about giving others a voice. It is about helping others to build self-esteem. It is about fun and joy and color and humor. It is about how a need gets taken care of without us even noticing it. It is about entrepreneurship, being of value, being creative and resourceful. It is about a bit of life magic in the normally mundane. It is about passion and love. It is about one person who has an idea that is different from what he normally does and this idea expands and expands and becomes even more. Then the idea is shared and expanded more until it becomes something that is spread around the world and is shared so that others can join and participate. It all began with a simple idea. . . In Brazil, "catadores" collect junk and recyclables. But while they provide a vital service that benefits all, they are nearly invisible as they roam the streets. Enter graffiti artist Mundano, a TED Fellow. In a spirited talk, he describes his project "Pimp My Carroça," which has transformed these heroic workers' carts into things of beauty and infused them with a sense of humor. It's a movement that is going global. Looking At The Common With An Uncommon Eye. Spread Some Joy Today--by thinking of some ways you can share your value. I must be really old because my list is nonexistent. In things, that is. In those things that can't be bought, I am a picture of wide open arms. For the last few days, you may have noticed that I gave some focus on the idea of abundance. Although there is an abundance of things at the mall and on the Internet, it is those non-things that hold more meaning to each of us and that includes people of every age. "Your most precious, valued possessions and your greatest powers are invisible and intangible. No one can take them. You and you alone can give them. You will receive abundance for your giving." May The Gifts That Only You Can Give Bring You The Abundance You Rightly Deserve. Spread Some Joy Today--because you can and as you do so, you will be swept along in all its glory. It's interesting to find this quote when just the other day I mentioned that when I let go of fear, even in steps or pieces, what fills that space is gratitude, and what also comes with that gratitude is a sense of the abundance that we already have. Many years ago, my wife had a computer program that was a teaching program to share how people around the world lived. It was particularly focused on their material possessions. I remember going through it and seeing a family in rural Africa standing outside their mud hut of a home with all their possessions around them, along with a list of what those things were. All of their possessions would fit in one of my closets. Each country and number and selection of possessions changed, but in all of them, the number of possessions and the cost of those possessions was so small compared to the average person in the United States. I look around my office, or around my home and there is an abundance of things. I gained pleasure or satisfaction of some kind of gathering them over the years, but now they hold so little value except the very small number of things I use all the time. Yet, many of us in this country, and I have to include myself in that, think we have so little. Some people are challenged living in a 4,000 square foot home. I live in a 1,250 square foot home and if you add my office which was once a garage, it is 1,850. To me, that is plenty and has been for almost 30 years, but you can't even find new homes that small anymore. This isn't about that it is not good to want more. Desire is the stuff of life. What it is about is realizing the abundance we already have. In other words, to be grateful for what we already have, for the abundance that we already have. There is plenty more abundance all around us, and because it is abundance, it has no end, so going for more of it is awesome. And, at the same time, I think it is good to put things into perspective from time to time, find that gratitude, release that fear and see the abundance there now. I am so very grateful for all of this around me. I value my ability and desire to find more abundance. And, one more thing on this. It is equally valuable, and something I've only recently learned, to find gratitude and joy in other people's abundance. Now when I see someone with much or a very expensive car, or a large home with a finely manicured property, or healthy children, I mentally express my joy for them and the abundance that they have found. As I do this, I see more of the abundance that I already have and had had all my life. Celebrate Your Abundance. Celebrate Everyone Else's Too. Spread Some Joy Today--Let joy be a part of your abundance. ("This frees me up to do something more profitable.")." Seth continues from his blog post by saying, "When you get rid of every job you do that could be done by someone else, something needs to fill your time. And what you discover is that you're imagining growth, building partnerships, rethinking the enterprise (working on your business instead of in it, as the e-myth guys would say). Right now, you don't even see those jobs, because you're busy doing things that feel efficient instead." I understand this point of view and it is exactly the point of view I had when starting my business and where it is now. I'll never forget when we hired the first person and how nervous we were about that, and that it turned out to not only be good but was absolute perfection. It was Jean and she is our head web designer and has been with us since 2008. What a blessing to us. I'm constantly thanking you, Jean. Constantly loving you too. You have helped take us far beyond what we thought was possible. Several years ago, the delegating began in a similar way, which allowed me to focus in other areas, and now there are eight people. It's amazing what you can think of when you have the luxury of not trying to be efficient all the time. This is not only true of entrepreneurs, but it is also true of any manager. And, Seth's statement is pretty much the way I looked at myself as a manager, which I did for others most of my life. It's so easy to get caught up in the busy aspect, or the important aspect of the position and forget about what the real goal of a manager is and that is to get work done through others. If I were hiring a manager, I would look for that quality of creativity and entrepreneurship. I would look for the same thing in the entrepreneur. Come to think of it, this is not a bad thing to find in an employee. Initiative and creative use of time is a grand combination. That is in the best entrepreneurs, managers, and employees. The Bigger Picture Is Always The Best Strategy. when you have the next destination." We all have epiphanies. I had another today. Each one changes my direction just enough to get me going on a new track, or maybe it could be seen as getting back on track. I love Brad Pitt's way in that he says, "when you have the next direction." To some people, I am sort of "Mr. Positive." I certainly want to be positive, and obviously, these Daily Inspirations are intended to be uplifting or inspiring in some way. Yet, for me, the philosophical part has come fairly easy for me because I've been studying various leaders in this field for a long time. Understanding it is one thing, and practicing it in my own life daily is another. I am and have long been willing to practice, but much of that is philosophical in nature too. So, I have these little epiphanies which wake me up to my commitment to live by what I espouse. Not so that I can be qualified to speak on the subject or that I might be seen as having made it, but so that I get the benefit that is stated in the philosophy in my life right now. Of all the teachings that I have studied, it is the teachings of Abraham by Esther Hicks that speaks to me so clearly. In this, the idea of paying attention to your emotions (they call it the emotional guidance system that we all have) and when something is causing you to not feel good, that is a clue to do something, think something different that will cause you to feel better, until eventually, you can feel good. So the negative emotion isn't bad, but it is good because it gives you the information you can use to change. Yet it is so easy to fall into the negative egotistical scenes played out in my head when something happens or someone says something. I begin to justify myself talking in my head. I begin to build a case for my rightness. I go over scenario after scenario of what I would be saying to defend myself. These have always been common in my head and I'm sure I am not alone. The teachings say to pay attention to how I am feeling and when I have those scenarios, they always cause nervousness, fear, defensiveness, and all of those are not feeling good. I used to go on and on and the only escape was to escape into some distraction. But, that only put it off for a while and then it was back. All those justifications have never ever helped and they are simply the ego trying to save itself and look good by tearing everyone else down. The only real solution is to change the thinking and the goal is to feel good. Often it must be taken in steps. Maybe even baby steps. It isn't something where a leap will work, so the idea is to think a better feeling thought. Maybe it is only a little bit better, but it is in the right direction. Today, I went beyond the philosophical aspect and realized where my head was at the moment and I began choosing slightly better feeling thoughts until I turned a corner and felt better. I didn't feel good yet, but better and that was enough to cause significant movement. I call it an epiphany because it is a new direction in that I've gone beyond the philosophy to the awareness to the actual practice. It felt so good to be in this place, I can tell you. I never want to go back to not paying attention, to not be aware, and to not be empowered by this. As I felt this place, I felt so different. I wasn't fearful about anything. Instead, I was grateful. Grateful for the circumstance that I was mulling over in my head and grateful for the empowerment to change. It's Fascinating How Gratitude Is Exposed When Fear Is Released. I Never Saw It From That Perspective Before. Spread Some Joy Today--Gratitude causes joy. In this case, I see a similar situation: Having the same thoughts and expecting better results. Of course, the quote is indicating that whatever the thought-seed that is allowed to grow will bear that fruit, good or bad, in act, opportunity, and circumstance. It matters not whether those thoughts are intentional. If you think about that, it would seem that choosing your thoughts would be so much more productive in a positive act, opportunity, and circumstance. it is made by sour thoughts." Know someone who sees everything that is wrong and almost nothing that is right? Like a newscast, only in person? Should, should, should. Worry, worry, worry. What good is it? for dispersing the shadows of grief and sorrow. is to be confined in a self-made prison hole. will bring abounding peace to their possessor." They love the drama, the excuse that the "reality" of illness (because a "doctor" prescribed something, or acknowledged a name for their condition) makes it legitimate to complain because they have officially diagnosed symptoms, perhaps with statements like it is hereditary and such. That takes the blame clearly away from themselves they think, but it is a self-made prison. Almost anyone who is really watching and listening can see that because it is easy to see it in others. Is the difference genetics? It is the choice of thought. I know it extremely well because I changed mine and it changed me. In today's world, there are so many things each and every day that could get you down if you would let it and many do. Those same things can also give one a grateful attitude, a cheerful disposition, or even joy. The things did not change, but only the thoughts about the things. We have absolute control over but one thing: thought. I underlined one sentence in the quote above: "to patiently learn to find the good in all. . ." because it is a powerful tool to lead one toward being cheerful and happy. It isn't easy necessarily, but it is very doable. I now strive to be thankful for and find the good in every person, situation and thing. I can assure you that some are a serious challenge to my commitment, and some take longer, but I am getting there step by step. It takes practice. You don't just wake up one morning and find yourself there. You decide to be there and accept the challenges with the easy. The good news is more are easy and less are challenges as time goes forward! Choose Yourself A Perfect Day! Spread some joy today--by spreading those thoughts that feel good. It's a safe bet they will feel good to others too. "The subconscious mind. . .
a thought driven by courage, or faith." Yes, I Can Because I Think I Can! Spread Some Joy Today--Give Praise To God (or whatever name you like) For Everything You See Today! "Hello. Yes, this is Mr. Kadam. I'm the chairman of Kadam Enterprises." I just watched The Hundred-Foot Journey movie which was just released a couple days ago for video. I really enjoyed it and the characters. With Papa Kadam's quote, I thought how interesting that statement was, and how profound at the same time. He was absolutely right. He was the Chairman of Kadam Enterprises. I am the Chairman of Minion Enterprises, you are the Chairman of (Your Last Name) Enterprises. It could be a large family as in this movie, but each is the Chairman of their enterprises. Each is in charge of all the direction and action and activity. Each is in charge of the choices and decisions. Each is in charge of how they want things to be. There are times when even the Chairman must make compromises, go slowly over speed bumps, drive cautiously through school zones and such. It is a co-creative endeavor, this life, yet fully we each are in charge of far more than we give ourselves credit for. So Go For It. You're In Charge! You Are The Chairman Or Chairwoman. Spread Some Joy Today--When kissing your loved ones, linger a few moments longer. Allow it to register completely. I've always rather known what is coming than to wait and find out. I've used this as a strategy in all my positions of employment. In 1997, after 25 years in the auto business and the last 8 of it in commercial trucks where I also used this strategy, I went to work for a major west coast truck body manufacturer. I started at the end of July 1997 and created my own position with the approval of the owner. 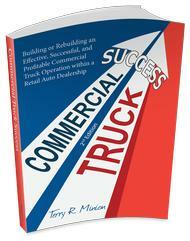 In the first seven months of that year, they had sold $188k worth of truck bodies in Northern California. In the five remaining months of the year, I sold $1.4 million. How could that be? I had a strategy. Before, they would just show up once every six months and see if you wanted anything. I used to be a customer of theirs, so I know how it was done. I went to dealers and took my own strategy of planning for what I wanted rather than waiting to see what's left and created a whole new market of pre-orders, which I then managed for them and created reports so they knew on a weekly basis what was where in the pipeline. They always had the opportunity prior to release into the production of making changes or rearranging priorities. It was a strategy that paid off handsomely to Harbor and equally to the dealers. Just to show the potential of that, in the first 5 months, I took one order from one dealer for 110 units which was never even thought possible. I took a whole year's worth of orders in one day at a lunch meeting. This is not a brag, but an example of how this planning strategy can work. In my current business, we started out selling websites and we had other things like a newsletter, etc. that rarely sold. It was hand to mouth living. I hated it. Then, I had a planning moment. What did I want? Constant cash flow. How could I achieve that? By changing my business to a monthly service with long-term increasing value. It was like turning on the floodlights in a small dark room. Many wise teachers say that we create our own reality two ways. One is by default and the other by choice. Much of the world creates by default. I still see dealers doing this by seeing what is available rather than making choices through planning. Both are a reality. The only question is which works for you? I know which works for me. I would rather take my time and plan what I want than to rush and take what is currently available. There is a far more pleasing outcome. Spread Some Joy Today--by making some choices and decisions. "Don't fake it 'til you make it. Fake it 'til you become it." About two years ago, Amy Cuddy did a wonderful TED talk on the subject of Empowerment Through Body Language. The original talk was 21 minutes long and certainly worth watching; however, I found a shorter version that is only 6 minutes covering the essence of the talk. I am a huge fan of the concept of acting as if. Act as if I am in that position, etc. It is a legitimate path to success, and often a shorter one to boot. I have faked things so many times and firmly believe her quote about faking it until I become it. The more interesting aspect of the video is the power stance theory. Well, it's not a theory anymore. She has proven that it is real and it is effective. Tony Robbins has been teaching a version of this for a very long time. I hope you enjoy the video and the excellent message it contains. It's More Than Attitude, But There Certainly Is Some Of That. Spread Some Joy Today--by leaving your insensitivity at home. Don't worry. Be happy.